The only common ground people find with Dulle Griet is that no one knows what the hell is going on. Turn left, a hell mouth. An egg n' eyeball scheme throughout, which is just not a normal obsession. At bottom left, beetle man with hat and Humpty Dumpty with a spoon in its cloaca-mouth. More eyeball monsters at bottom center. It's like Bruegel had a vendetta against the early optometry industry. The painting's eponymous "Dulle Griet" (Mad Meg for you without Dutch tongue) was a sort of badass. Mad Meg is said to have collected together and gone on a ransacking trip straight to hell, stealing everything in their path. Mad Meg is basically the 16th century Dutch version of Imperator Furiosa in "Mad Max: Fury Road." Likely created in the 1560s, the painting was lost until it appeared, mislabeled, at an auction in Cologne in the 1890s. The auction catalog called the work A Landscape with Ghosts, picking a pretty good name for the painting, and a great one for my Pacman tribute band. No museum wanted Dulle Griet, despite the improved title. A young Antwerp collector named Fritz Mayer van der Bergh purchased the work for a song. * Turns out the painting, like many by Bruegel, is signed and dated, but the Dulle Griet signature is sloppy and nearly unreadable. So at first, the work was at first attributed to Pieter Bruegel the Elder's less talented son, Pieter Bruegel the Younger (sorry Lil' Piet, you just don't got game like Big Piet). According to Flemish lore, Dulle Griet is a witch with both amusing and scary personality traits. There is also a Belgian beer named "Dulle Griet." 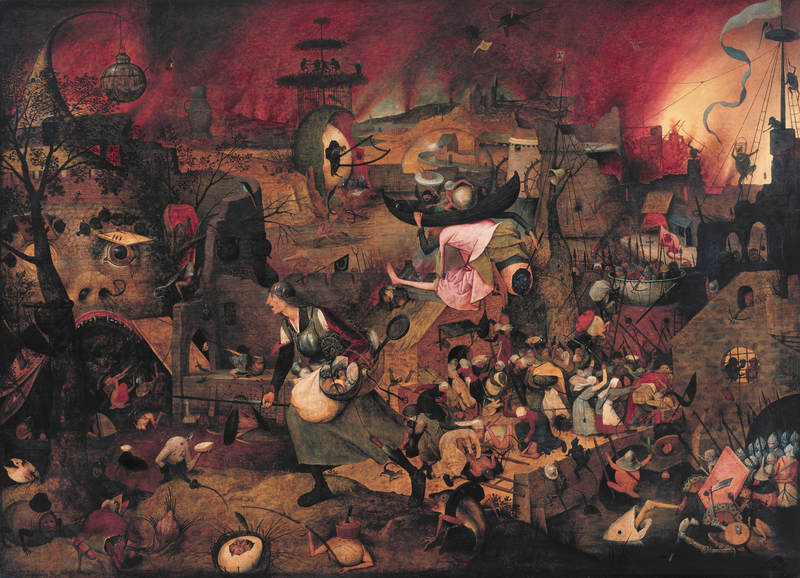 Some believe that this painting may have been inspired by the Flemish proverb: "One woman makes a din, two women a lot of trouble, three an annual market, four a quarrel, five an army, and against six the Devil himself has no weapon." 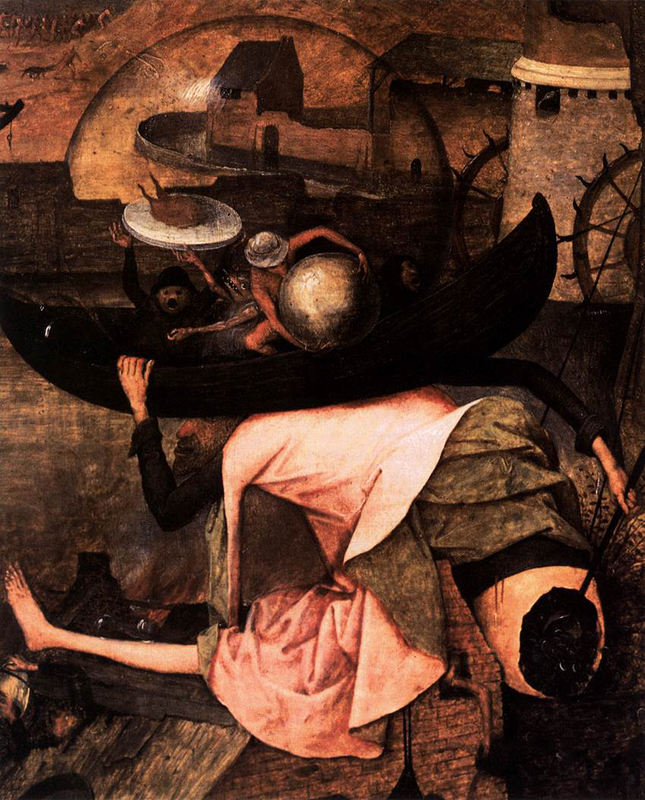 Dulle Griet (anglicized as Dull Gret), also known as Mad Meg, is a figure of Flemish folklore who is the subject of a 1563 oil-on-panel by Flemish renaissance artist Pieter Bruegel the Elder. 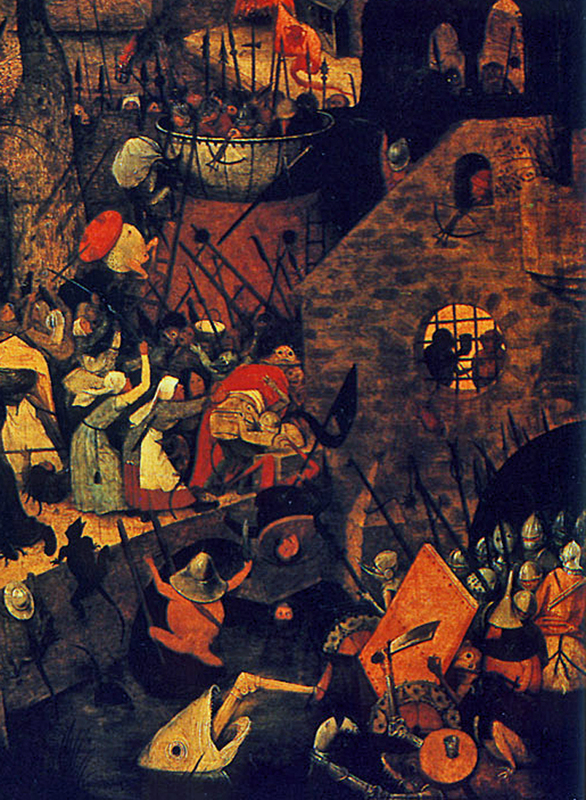 The painting depicts a virago, Dulle Griet, who leads an army of women to pillage Hell, and is currently held and exhibited at the Museum Mayer van den Bergh in Antwerp. A restoration of the painting in 2018 revealed that it was painted in 1563, shortly after the painter had moved to Brussels. Previously, the signature and the date on the painting had been illegible, and it was assumed that it was painted two years earlier, or, based on its close compositional and stylistic similarity to The Fall of the Rebel Angels and The Triumph of Death, one year earlier. 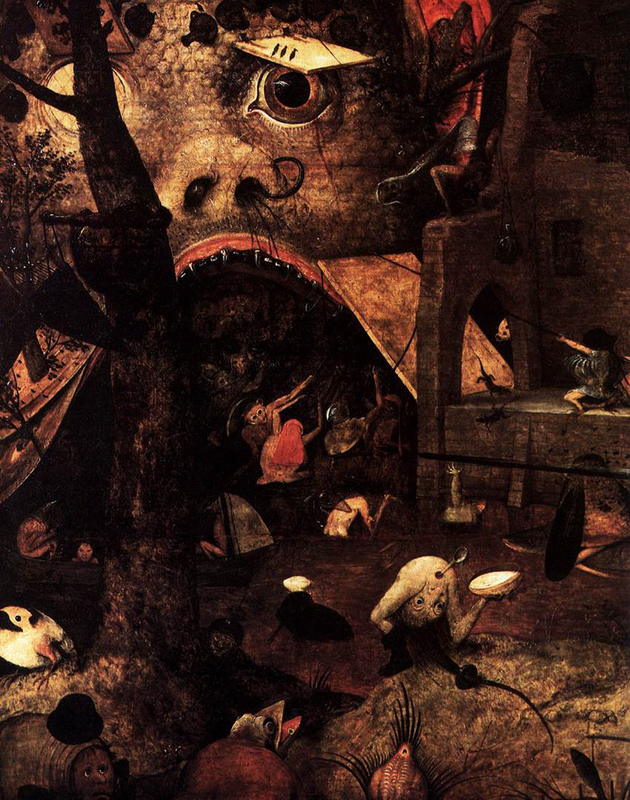 Like those pictures, Dulle Griet owes much to Hieronymus Bosch. It is assumed the painting was destined for a series. Bruegel's earliest biographer, Karel van Mander, writing in 1604, described the painting as "Dulle Griet, who is looking at the mouth of Hell". It came into the collections of Rudolf II, Holy Roman Emperor, then was looted by the Swedish troops in 1648, and reappeared in Stockholm in 1800. Art collector Fritz Mayer van den Bergh discovered it in 1897 at an auction in Cologne, where he bought it for a minimal sum, discovering its actual author a few days later. She could plunder in front of hell and return unscathed. Bruegel is thus making fun of noisy, aggressive women. At the same time he castigates the sin of covetousness: although already burdened down with possessions, Griet and her grotesque companions are prepared to storm the mouth of Hell itself in their search for more. Dulle Griet appears as a character in Caryl Churchill's play Top Girls (1982), where she recounts her invasion of Hell: "I'd had enough, I was mad, I hate the bastards. I come out my front door that morning and shout till my neighbors come out and I said, 'Come on, we're going where the evil come from and pay the bastards out.'" (Churchill, 28). One woman makes a din, two women a lot of trouble, three an annual market, four a quarrel, five an army, and against six the Devil himself has no weapon. Check out the full Wikipedia article about Dull Gret.